The Option Buttons display format initially appears as radio buttons, but what if we wanted them to show as actual buttons? Change the 'Render as buttons' value from No (default) to Yes and the radio buttons will now appear as buttons. This is a great feature of Nintex Forms, but what if you wanted to really change the value of the background color of a selected option button when selected? Here comes simple CSS to apply this change! So far, all that has been placed on the form is a Choice Control, with the display format as 'Option Buttons' and the Render as buttons setting set to 'Yes'. If you have accomplished this already, you're ready for adding some CSS. If not, please add the control and make the required setting changes. The Choice control is different in how it is displays in the DOM and you'll need to dig to see if there is an attribute associated with the selected button that will allow you to change the color. Using the Developer Tools (F12), walk through the DOM Explorer to find the choice control element. The button text is located in a <span> element, but there isn't any way to see if that <span> has been selected. The parent element of the <span> is a <label> element, which contains an attribute, aria-pressed="true". Now we got it! Add the following code in your Custom CSS section under Form Settings in the Forms Designer and you can target the span element, who is a child of a label element, but only when the label element has an attribute of aria-pressed=true. The hex code of the selected button can be any color, but this will give an idea of how easy it is to change a background color on the Choice control of your Nintex Form. Currently writing from Calgary where I got to spend some time with some amazing people, places and unreal eats! While meeting with customers, I was asked an excellent question about hiding some portions of a Nintex Form when using Print to PDF. So, can it be done? You know it! Next, we are going to take advantage of media query listeners in CSS and use the media type of 'print' to hide those elements if the class of those elements match our CSS selectors. After you have entered in the above CSS, save the form settings and publish your form. Let's take a look at our finished form! If you open the display form, you'll notice it looks exactly the same, and that is exactly what we want. However, if you click on 'Print to PDF' in your ribbon and open the PDF document that is generated, you'll see something different. Pretty easy to get up and running and looks awesome! Feel free to leave any comments or questions and as always, keep being awesome! After you have created a List and added the columns you wish to collect, we need to snag the CDN links for WinJS. Next, a Rich Text Control will be added to the Form so we can place some HTML within the form and create our own <div> elements. NOTE: You will have to link to whatever images you wish to use. I had some simple icons that I link to in my form, but feel free to change the picture value to the appropriate picture source. OK, now that we have our code, let's take a look at what is actually going on. If you were developing Windows App Store Apps with WinJS, you'd notice that all the code is wrapped in a Immediately Invoked Function Expression (IIFE). This is good for two reasons: one it prevents namespace collision and two, it immediately invokes the function. However, in our example, we are wrapping the code in the NWF$(document).ready() event. So, what did we create? We made a flip view photo gallery that will allow the user to move forward and backward through a set number of images. For more information on WinJS, please visit http://try.buildwinjs.com/ and tryout their awesome Playground experience to get more familiar with the available controls. You'll notice that some of this code looks like that of the playground, and that is cause it it! Big shout out to the WinJS team for building such an awesome set of controls to easily blend into your forms or app. Although Nintex Forms allows you to show/hide labels to show additional information, sometimes it's just nicer to use a dialog box. In this example, I'll show you how to pop up a dialog box when you choose a certain value from a drop down. Let's get to it! Next, we will need to grab the CDN links for jQuery to greatly reduce the amount of code we will need to write. Next we will add a Rich Text Control and get ready to add some code! Great, now let's save these settings and Save the form in the designer. Let's take a look at what we just built! On form load, you'll notice that that Rich Text control is no longer visible. Pretty cool feature with just a tiny bit of code! Nintex Forms recently released the awesome functionality of Print to PDF. This feature allows users to render their forms in a PDF format for either printing or saving. Since you are using Nintex Forms, which allows designers to add custom CSS, I thought we should take it one step further and add a watermark to our printed forms! Wanna see it? Here it goes! Open the Nintex Forms designer for either SharePoint 2010 or 2013 and expand the length of the canvas in Form Settings. Next, add a bunch of Single Line Text and Date/Time controls to your form. I would also recommend adding some labels to identify the input type controls. Within the form, you'll see a box that I've added behind some of the input controls. This is a Rich Text control. Next, I'll show you why you just added that Rich Text Control to your form! After you publish your form, go ahead and create a new item. Place info in all of the inputs and save. Open the newly created item (notice no watermark) and click on the 'Print to PDF' button located on the ribbon and look at your new work! Nintex Workflow for Office 365 contains the great Assign task action that allows for a ton of flexibility in how the action is configured. Sometimes, you may want to take advantage of LazyApproval, Reminders and Escalation, but only want to have one outcome. How you ask? CSS to the rescue! Open Nintex Workflow for Office 365 and add the Assign a task action. From here, double-click the Assign a task action and click on Edit Task Form in the ribbon. Notice that there are two outcomes, "Approved" and "Rejected". We want to get rid of the "Rejected" option. So this CSS says nothing about hiding an option or label. What are we doing here? Nintex Forms stores the Radio Button Choice control options in a table. We want to remove/hide the second row of that table. Using CSS, we select the <tr> element and then only call on the second row (2) of that type of element. From there, we set the display property to a value of 'none'. Not too bad for one line of CSS! 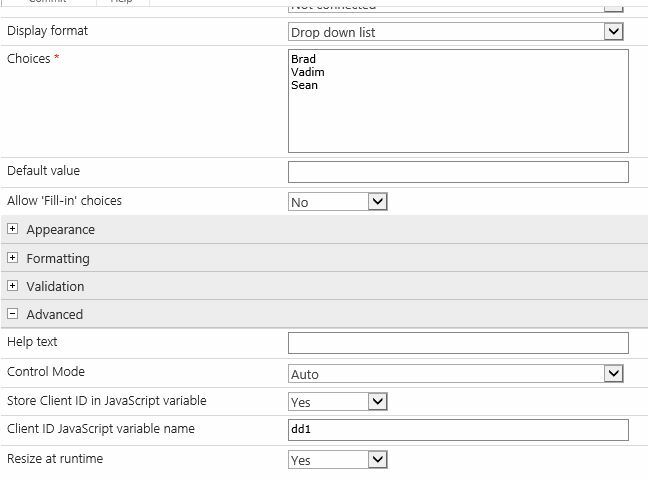 While at work today, I got this great question about how to build dynamic option values in a drop down control based on the output of other drop down controls. Open the Nintex Forms Designer and then add three Choice Controls. Easy enough, right? Now let's get to the code! Latch onto the change event of both of those controls. Store the selected values of both controls. Create and Object to store those values. Remove any values that existed before the change event. Append the new options as the available values for 'dd3'. I'll go ahead and choose a value for the first two drop downs. The selected values will be the only options available in my third drop down. I've always fancied a BMW, so let's give only those options. Give it a try in your Nintex Forms environment! Like always, I'd love to hear your thoughts and questions in the comments section. Thanks for reading! Nintex Forms has awesome Conditional Validation/Formatting rules and I highly recommend taking advantage of them when building your forms, but sometimes you need validation or formatting of your form when a certain event occurs. I was working with a customer and they had a great question of making a checkbox enable only after a user clicks on a hyperlink on the form. Awesome use case and I'll show you how it's done! Open the Nintex Forms Designer and add one label control and one Yes/No control. Here is what the form looks like in Design mode (I'll show you the HTML to write in the Label control in a bit). In the label control, open up the Control settings and then click in the body of the Label Control, then click on Edit Source in the ribbon. Save the HTML in the label control and also the label control settings, and then open up Settings in the Nintex Forms Ribbon at the top of the designer. Click Save to save the new Form settings and now it's time to test out your form! Notice the Yes/No control is disabled even though the link (the word 'Nintex') is purple because it's a link I have visited. This is important if a person will use this form more than once. Now, I'll try to submit the form without checking the box either and without clicking the link. Lastly, I'll visit the link to enable to box and check it. Not too bad for the first real post of the year! Like always, feel free to add any comments or questions below. It's horrible, it's ghastly, it's from the early 90's! I'm proud to say that Nintex has allowed me to join Andy Budiman, UX Manager for Nintex, to give a talk at InspireX about Nintex Forms best practices and extensibility. For those interested in attending, you'll find plenty more information on Nintex Workflow and Forms. If you have any questions or topics you'd like either Andy or myself to discuss, please leave comments below! I'm lucky enough to be a Technical Evangelist for Nintex, which means I get to travel all over North America and speak at User Groups, Conferences, SharePoint Saturdays and other gatherings. I usually get to talk about some awesome things you do with Nintex Workflow/Forms/Mobile and I'd like to be able to show some of those talks with those that are not able to join me at the conferences. For those that are able to join, I'd love it if we can continue our talks here about whatever topic was discussed or any additional topic you'd like to cover. The point of these blog posts are to make end users more enabled to design cooler looking, more functional forms, and if you are only able to see what I post on the blog and not what I talk about at speaking engagements, then I'm only supplying you with half as much content. So here's to an awesome 2016 and all the content we will cover! Let's go ahead and add some Single Line Text Box Controls to a Nintex Form in the Nintex Forms Designer. For example, if we wanted to create an input to collect emails, we can call the variable name 'varEmail'. For example, the Range Single Line Text Box can be configured to have a default value, and minimum/maximum values for how far the slider will move. NOTE: The color picker will work in Chrome (not IE, currently). Also, all of these controls can be connected to your SharePoint columns to collect the values you have entered on the form! Feel free to leave comments if you have any questions about the form layout or code! One of the most asked questions I get is how to set the default value of a control on Nintex Forms based on the value of another control. Usually this is based on a Choice (drop down) control. The following post will cover how to set those defaults in a Single Line Textbox control when using a Choice control with a drop down view. Nintex Forms allows for Forms Designers to create some really awesome ways for users to interact with forms and create an awesome experience. Well, let's take that experience one step further and build out a form with transitions from panel to panel instead of using tab-like functionality. NOTE: Panels 2 - 3 will require two button (labels) for Next Slide and Previous Slide. Save and Cancel buttons for panel 4. NOTE: Each panel has it's own CSS class. This is to assist us when calling on the .fadeIn() / .fadeOut() jQuery. Once you have added the CSS classes (Nintex Form Settings > Custom CSS), please ensure that you add the appropriate CSS class to each panel (control settings). There are a lot of users that love to use their keyboard instead of their mouse when navigating through an online form. I don't blame them, pressing 'Tab' is much faster then dragging a pointer and clicking in the next field. But what if I want to set up a custom tab order in my form? The following post will show how to setup a tab index in your Nintex Form. NOTE: My CSS classes are: firstStop, secondStop, thirdStop. Nothing too much to show here, but all user interaction, however when the form renders, users will be able to tab through the inputs you have added to your form in the order you specify! Feel free to post any questions/comments about this post! As of the time of writing this post, Nintex Forms does not have an ability to add server-side CAPTCHA out-of-the-box. But what if you want to have a random word generated on the screen and then have users enter in the correct word before they are able to progress with the form? Well, I have a workaround for you! NOTE: This validation is performed client-side. Open up the Nintex Forms Designer and add a Rich Text control. After adding the Rich Text Control, open the configuration settings of the control and click body of the control and then click on the 'Edit Source' button. Next, click on the Save button and add the CSS class name to the control: "testClass". Open the Form Settings in the Forms Designer and expand the 'Custom CSS' section. What happens if I enter an incorrect term in the Random Term output input? So what happens if I enter the correct term? Notice that the Save button now appears! Only if the values match, will the save button appear per the CSS classes we assign the button control. Feel free to leave any questions or comments and remember to check out Nintex Connect for awesome information on all things Nintex! 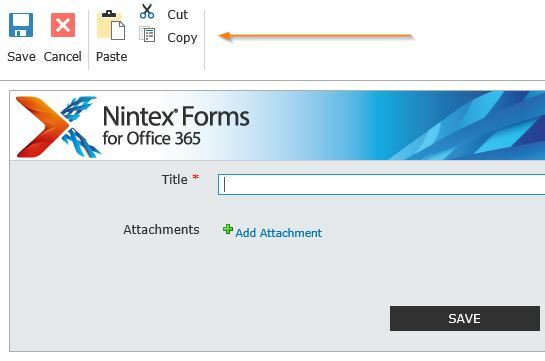 The ability to add custom CSS (inline and through external files) in Nintex Forms for Office 365 allows you to can change the way the new/edit/display forms look. For Example, let's look at removing the ribbon in your Nintex Form. To find the CSS Class we need to change, use the Developer Tools built into the browser you are using (F12 for Internet Explorer) and select the element you wish to hide. Now that we found the <div> the ribbon lives in and the CSS class applied to it, we can find the parent <div> and class and add the correct CSS in order to collapse the element. Go back to the Nintex Forms Designer and Select Form Settings > Custom CSS. Click Save and then Publish your form. Feel free to leave any questions or comments and remember to check out Nintex Connect for awesome information on all thing Nintex! Nintex Forms is awesome and offers a ton of flexibility and methods to add custom functionality to your form. One bit of functionality I've been asked about was a progress bar. For example, you have a Nintex Form with tab functionality, but you want to have a progress bar on each panel to show how far along the end user is with the sections they are filling out. Let's take a look at how to do that. Now the fun part. Nintex Forms allows you to add custom HTML to controls such as 'Rich Text' and 'Label'. When you click on the body section of the control configuration, you will see a button for 'Edit Source'. Add a label control to each panel. Now, in the first label you added, open up the configuration settings (click Edit Source!!!) and let's add the following HTML! Make sure you have clicked 'Edit Source' before you place the code in, because otherwise the label will render the exact text value you entered instead of a progress bar. This is pretty simple stuff, but visual aids like a progress bar go along way with improving usability. I then added a label next to each progress bar to note it is for showing the progress of the form, and viola! After adding the additional rules for the second and third panel, give the form a test. Feel free to leave any questions or comments and remember to check out Nintex Connect for awesome information on all things Nintex. Some work should be coming up soon.